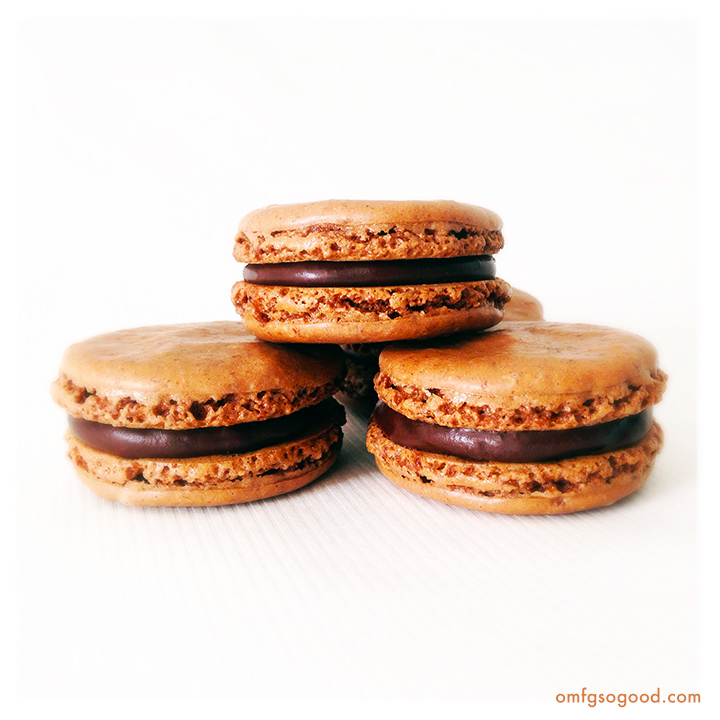 chocolate cinnamon macarons | omfg. so good. I’ve been a teensy bit obsessed with macarons for the last few weeks. Okay, there was nothing teensy about it. I was straight-up crazy. I made no less than four batches trying to achieve some sort of personal idea of perfection. Whatever. I totally caught him sneaking a few of these bad-boys after the kids went to bed. Stop the madness, my arse. Nothing would keep that guy from sneaking a sweet treat. Anyhoo, my crazy food hang-ups will, of course, benefit you as they always do. 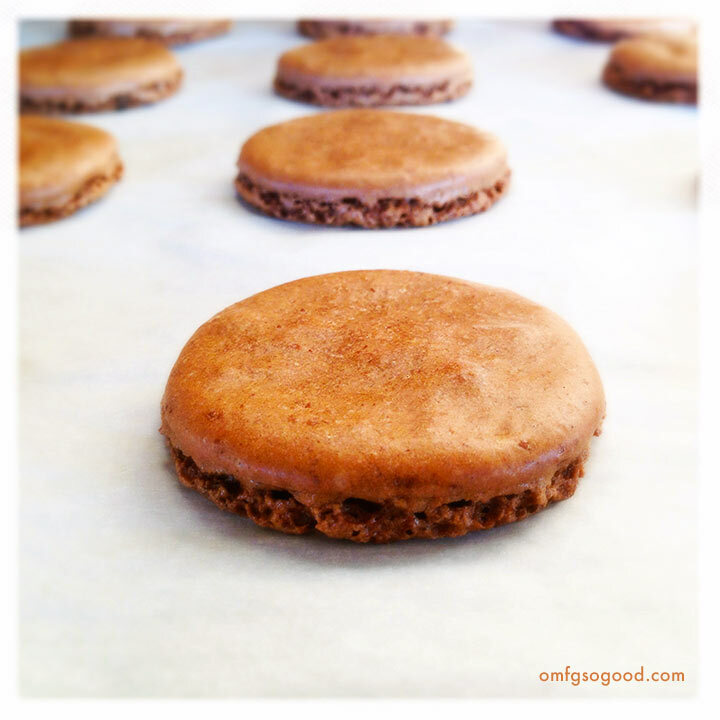 Now I have a no-fail, macaron recipe to share. 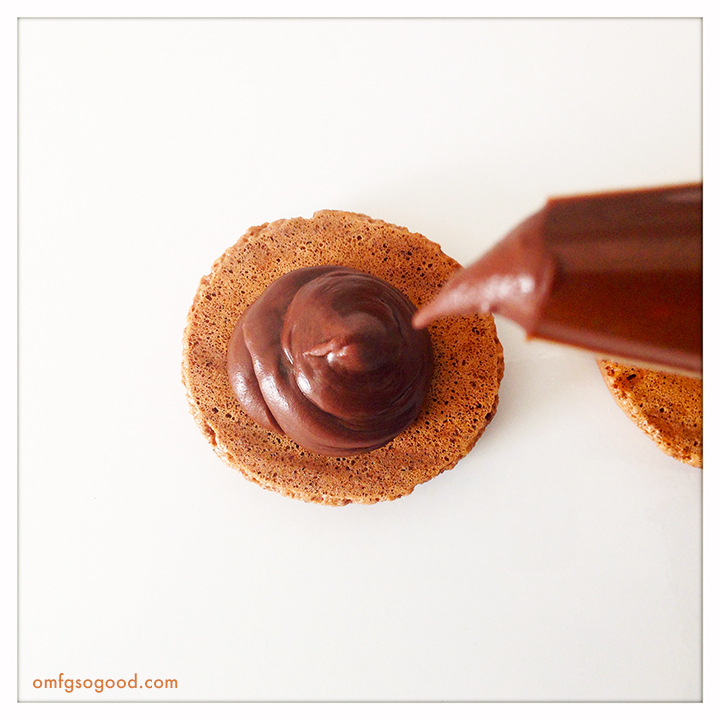 Step-by-step instruction to sweet, indulgent perfection. My test batches included Vanilla Bean with Straight-Up Sweet Buttercream, Black Raspberry with Dark Chocolate Ganache, and Espresso with Baileys. The Chocolate Cinnamon flavor combination is, hands-down, my favorite. Yup, huge fan. There’s just something comforting and warming about the subtle hit of spice that kicks plain old chocolate up a notch. These just taste rich. Not rich in a bad, overly sweet way. Rich in the most decadent, wrap up in a fur blanket, kick-back with a glass of red wine, while nibbling indulgently on treat perfection way. Do this. You’ll be glad you did. 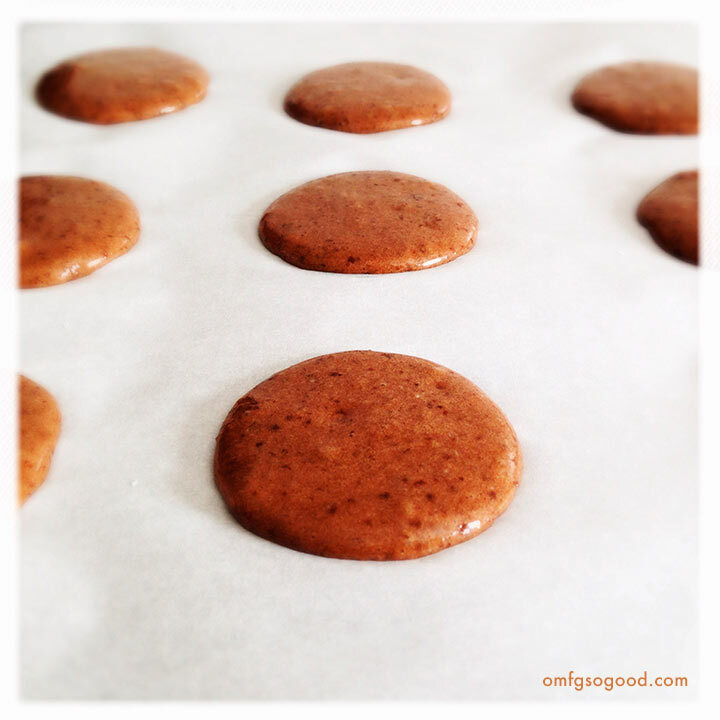 To make the macaron shells, line 2 large sheet pans with parchment paper. Use a small round cookie cutter (or anything else you’ve got that’s a circle roughly the size of a silver dollar, around 1.5″ diameter) and a Sharpie to trace circles 2″ apart in evenly spaced rows on the parchment paper. Flip the paper over so it’s ink-side down, and set the pans aside. Set the whipped egg whites aside. 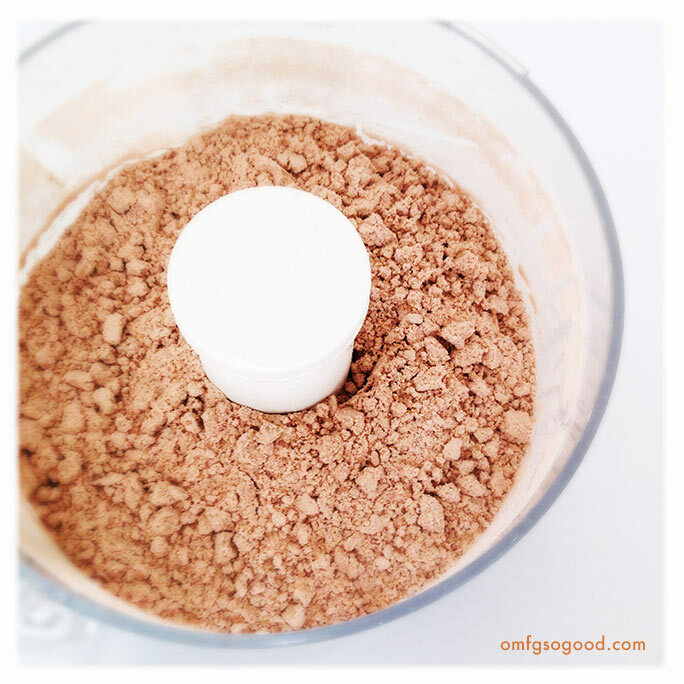 In the bowl of a food processor, combine the powdered sugar, almond flour, salt, cocoa powder and cinnamon, and pulse to grind to a super fine powder. This helps evenly combine the dry ingredients, as well as chopping up any large bits and aerating them to ensure a nice, light finished product. 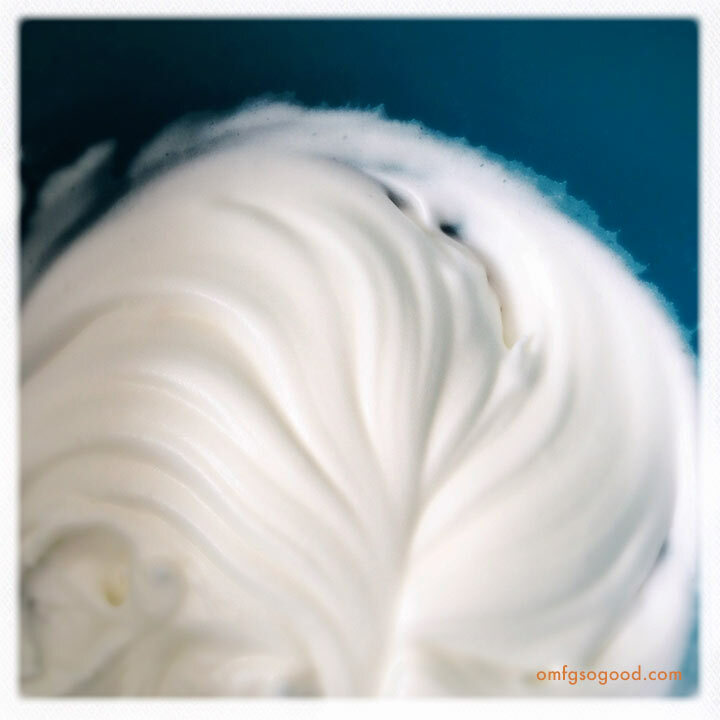 Use a rubber spatula to gently fold 1/3 of the dry ingredients into the whipped egg whites. Continue adding the dry ingredients in two more batches, gently folding in between. When the ingredients are completely combined, gently spoon the batter into a piping bag, snip off the end around 1″ up, and squirt an even amount of batter into the center of each of your drawn circles. When you’ve got them all piped, lift up each tray slightly, and gently drop it down on to the counter to settle the batter and help to develop that signature macaron foot. THE MOST IMPORTANT STEP OF ALL HERE FOLKS. Let them set for 1 – 2 hours to develop a hard shell on the outside before baking. Do not skip this step. When you’re ready to bake the macaron shells, preheat the oven to 300 degrees and bake each sheet individually for 14 – 16 minutes. They should be slightly raised and shiny, but not darkened. Don’t undercook them though or they’ll stick to your pan. Allow them to cool completely on the pan on a wire-rack before filling. To make the dark chocolate ganache, pour your chocolate in a microwave safe bowl and heat for 30 seconds, then stir to melt a bit. In a separate small dish, heat the cream for 20 seconds, then pour the cream over the partially melted chocolate and stir to combine until smooth and shiny. Add the espresso powder and stir to dissolve and combine. Chill uncovered for 15 – 20 minutes. Sandwich them with the remaining macaron shells and gently press them together to spread the filling just to the edges. It shouldn’t ooze out. Because that would technically be an imperfection. And we all know how I feel about macaron imperfection. Okay, okay… I know. Stop the madness. Here’s hoping the macarons looks half as professional when I bake them. What a wonderful and different combination for macarons.